Injection molded plastic on shoulders, chest and back for improved protection. Comfortable upper body protection. Reduces neck fatigue. Simple front entry system, opened and closed at the front with a Velcro and buckle closure. Multi colored and durable CRANK graphics on chest. Adjustable elastic kidney belt with Velcro® closure for a secure fit. Constructed from high-impact resistant, injection molded plastic, designed to protect the chest and back. Constructed from high-impact resistant, injection molded plastic, designed to protect the chest and back. Neck brace compatible. 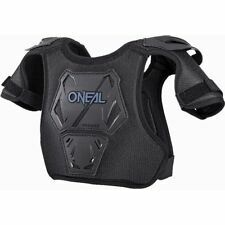 O'Neal Tyrant MX Knee Guard. Superior comfort and extensive knee, shin, and thigh protection. Double-jointed knee for snug and secure fit whilst riding. Exceeds EN1621 safety standard. Last YearsGear. 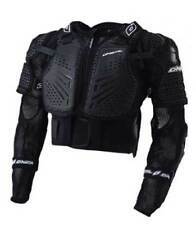 Injection shoulder and chest protector. Open web structure for optimal fit and maximum ventilation. Comfortable, adjustable Velcro® hip strap for support and a secure hold. Easy to take on and off. Can be worn under or over the Jersey/ jacket. Compatible with most chest protectors and roost guards. Simple front entry system, opened and closed at the front with a Velcro and buckle closure. One size fits all.